Electrical noise problems in automotive environments is almost never a problem now that most forms of communications therein are fundamentally immune to ignition and even computer interference. We relics who still listen to AM radio still sometimes suffer noise from lightning static, extreme arcing from electric service connections, and, yes, even from ignition sources. In fact, occasionally while listening to AM radio in my 2011 Jeep Patriot I will detect a whine that is proportional to engine speed. It is not annoying enough to warrant going to the trouble of chasing down and mitigating the source; I can live with it. 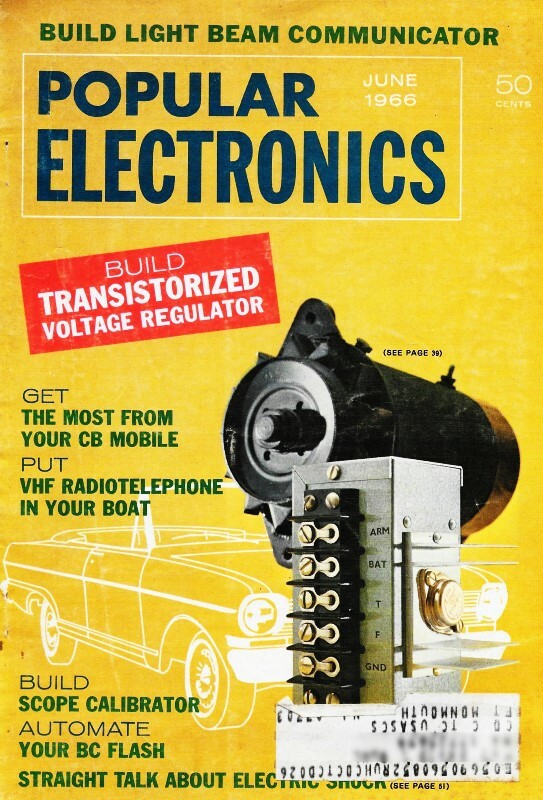 This 1966 Popular Electronics article presents a very thorough treatise on ignition noise causes and cures. The techniques are still applicable to modern vehicles. If you are a Ham radio operator with ignition noise on your mobile devices, you might find something here to help you. Suppress man-made noise to increase the effective range and readability. Electrical interference prevents clear reception and reduces the working range of mobile communications equipment. 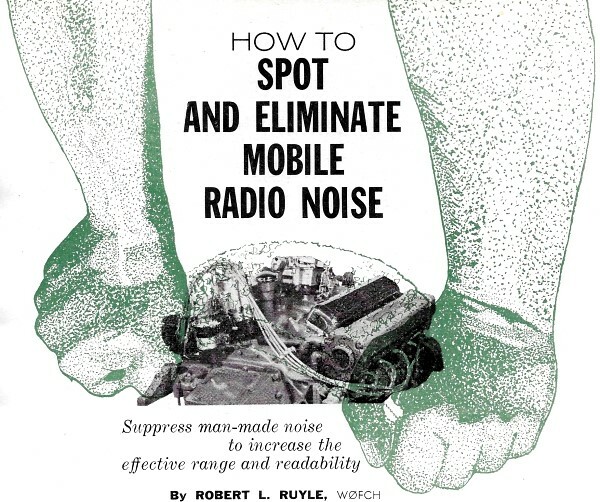 Efficient" suppression of mobile radio interference can only come about when you identify the source and determine how it is getting into your radio. The term "mobile" covers a wide range of vehicles: cars, trucks, trains, tractors, etc. Mobile radio installations are generally afflicted with noise from ignition systems, charging systems, switching circuits, moving metal parts, metal-to-metal contacts, and other electrical noises. 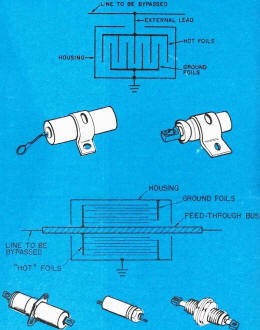 Each of these noise makers can be identified, and steps can be taken to suppress them. Ignition System Noise. Ignition system noise usually originates from one or more of four places: spark plugs, wiring, distributor, and the ignition coil. Reception distance can be increased considerably by suppressing noise at the receiver - without increasing transmitter power or receiver sensitivity. Spark plug interference is heard as a popping noise in the radio receiver which increases to a loud buzz as engine speed is increased. Use of a resistor-type spark plug is an effective way to suppress this kind of interference. The nearer the resistor to the spark gap, the more effective it is; the resistor tends to isolate the cable from the noise in the spark plug. The less noise in the cable, the less it radiates. Also, the high frequency part of the spark is "chopped off." One of the drawbacks to engine noise suppression is loss of power. Just like dirt inside the distributor cap, shields over the spark plug cables do cause a certain amount of high voltage loss. Alternators are usually equipped with a special filter to protect the rectifiers and to suppress radio noise. 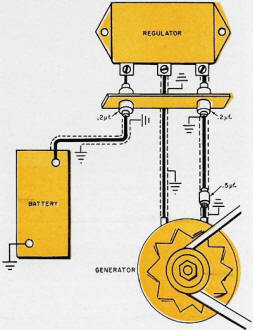 The generator's field terminal also requires a special filter. Do not use ordinary capacitors. 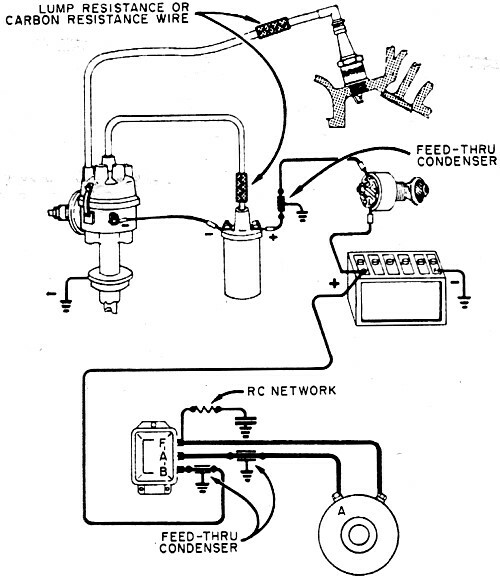 You can insert carbon-type suppression resistors in the ignition leads between the distributor cap and each spark plug or use suppressor-type cable in the wiring harness, but resistor-type spark plugs prove to be more effective and the easiest to troubleshoot when something goes wrong. Distributor interference also causes popping, and its pitch also varies directly with engine speed. Check to see that the distributor cap and rotor are clean. The distributor cap and rotor should be replaced every 25,000 miles for best performance. After 25,000 miles, the inside of the distributor cap usually becomes impregnated with millions of tiny metallic particles. To suppress the popping noise caused by the distributor, you can use a 10,000-ohm resistor or resistor-type cable between the distributor cap and the ignition coil. However, never use an external suppressor at the distributor cap center tower if the cap contains a molded-in resistor. Interference from the ignition coil can be bypassed to ground by inserting a 0.1-μf. feedthrough capacitor between the coil and its battery lead, and a 0.2-μf. bypass type on the points side of the coil. Wiring between spark plugs and distributor cap and between the distributor cap and ignition coil can radiate noise. A shielded ignition system offers the most effective suppression of ignition noise. For maximum voltage at the plugs, keep your high tension leads as short as possible. If shielding causes marginal engine performance, it may be necessary to install a higher output coil or a transistorized ignition system. Ignition coil interference can be easily filtered by installing a 0.1μf. coaxial-type capacitor. Attach the capacitor to the supporting band of the ignition coil and mount it as close as possible to the coil terminal. Disconnect the battery lead from the coil and connect it to the capacitor terminal. Connect the other terminal of the capacitor to the ignition coil using a short length of #10 copper wire. Also connect a 0.02-pf., 1000-volt, ceramic capacitor between the low voltage terminal on the coil and the ground lug of the coaxial capacitor. Be sure to keep the leads as short as possible. Generating System Noise. 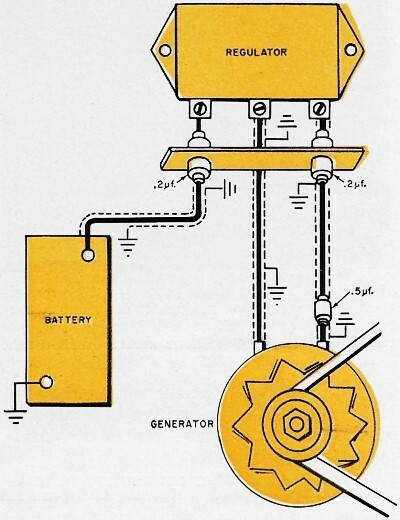 Noise from the generating system can usually be traced to alternators, generators, and voltage regulators. Alternators generally do not create a noise interference problem; but when they do, it's hard to suppress the resulting noise. The trouble, heard as a whine, usually comes from static buildup on the internal alternator elements. The best remedy for this condition is to insert a coaxial feedthrough type capacitor in each alternator lead, between the alternator and the rectifier. Install a 0.5-μf., 50-volt, 50-ampere rated capacitor. Generators are common offenders; often generator noise is blamed on the ignition system, but the telltale whine it produces should keep you from making a mistake. When looking for a means to quiet generator noise, be sure to install filters and capacitors in a proper manner, particularly around the generator's field terminal. Feedthrough capacitors and shielded cable can be used to suppress generator and regulator noise. If noise persists, a resistor-capacitor type filter can be attached to the regulator's field terminal. Voltage regulators cause an annoying interference when the relay contacts arc. The resultant popping noise in the receiver changes very little even when the engine speed is varied. You can relate this source of noise to ammeter movement while listening to the receiver. If the noise occurs at the same time that the ammeter needle swings to charge or discharge, chances are that the trouble is in the regulator. Here again, proper connection of a filter to the regulator is important. Do not install an ordinary capacitor on the field terminal of the generator or the regulator; it may eliminate the noise, but it can ruin the generator and the regulator in short order. Instead, use a special resistor-capacitor filter especially designed for this purpose. Accessory Interference. Electric windshield wipers, blowers, tachometers, sen­sors for 'idiot" lights, and a host of oth­er electrical gadgets are. all potential noise makers. Shields and bonding straps properly used are effective noise suppression devices. If not installed correctly. they can introduce new troubles. Mechanical and electrical connections must be well made. Accessory motors, such as the electric windshield wiper motor and blower motors for the heater and air conditioner, can usually be taken care of in short order by placing a 0.5-μf. capacitor between the hot-lead terminal and ground. 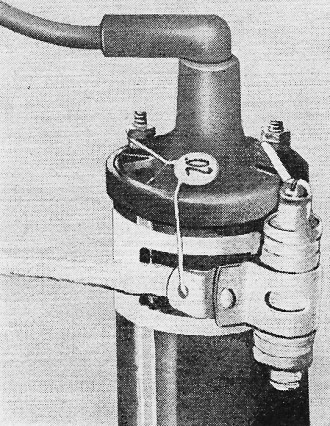 Tachometers can only be cured by using a good shielded wire from the engine pickup to the transmitter unit, and from transmitter unit to the meter indicator. Idiot lights, particularly the one for oil pressure, are frequent offenders. These lights are turned on by sensors that are placed at different points on the engine. 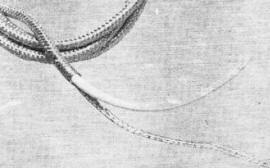 The sounds from the sensors can be recognized by a "clicking or hissing" sound in the receiver. Find the "noisy" sensor and install a 0.5- or 0.25-μf. capacitor. Instrument gauges such as the gas gauge can also cause a load of static, just like a noisy volume control. Use a 0.5-μf. capacitor to bypass the noise from the instrument to ground. Metal-To-Metal Contact. The best way to eliminate noise from metal-to-metal contact is to electrically bond the two pieces of metal. To check all the joints in a car requires a long and tedious search. Some of the most common trouble spots will be found along the exhaust system, particularly the tailpipe, and between engine and car body, hood and trunk deck and car body, air cleaner and engine, radio and car body, bumper and car body, and even between antenna elements. Bypass-type capacitors (top) are not required to handle line current, but have frequency limitations. Feedthrough capacitors (bottom) are better able to filter high frequencies, but must carry current. The importance of good bonding cannot be overemphasized, because if you don't have a good electrical and mechanical connection, you may very well be creating - rather than reducing - your interference problem. Wide braided straps of copper wire make excellent bonds when properly secured mechanically on clean surfaces. Be sure to remove grease, paint or other coatings that will compromise a good electrical connection. Don't overlook the little bonding clips between the hood and the car body. These little clips serve a purpose. Static Discharge. If you hear a "rushing" noise when your car is traveling down the road, and the noise disappears when you apply the brakes, chances are that your car's wheels arc building up static electricity. Check inside the outer wheel bearing dust cover on the front wheels to make sure that you have static springs installed and that they are in good condition. You can also inject graphite powder into the tires. To do this, let the air out of the tires, remove the valve core, squirt graphite into the tire, re-install the valve core, and finally, re-inflate the tires. 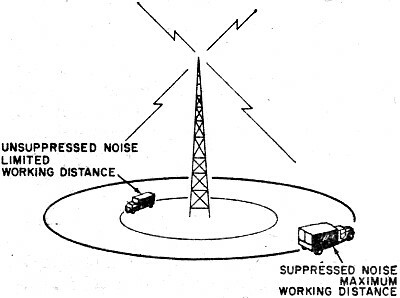 Interference Suppression Devices. There are five basic components or devices used to suppress radio interference: capacitors, filters, resistors, shields, and bonds. Capacitors are classified according to their internal configuration and their electrical properties. For noise suppression work, they are commonly referred to as either bypass or feed through types. Bypass capacitors have been with us for a long time. 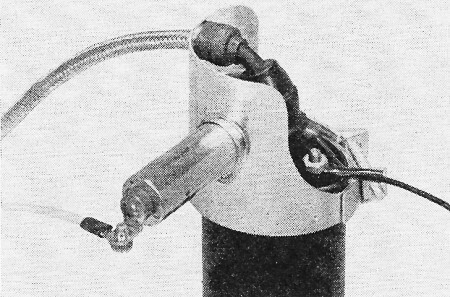 Normally, the metal case of the bypass capacitor serves as the ground terminal, and is secured to the equipment by means of a wrap-around bracket. The live terminal is usually a single wire lead that is connected to the line to be cleared of interference. The short lead wire on this type of capacitor becomes resonant at about 10 MHz and therefore limits its effectiveness to frequencies below this value. Typical bypass capacitors range in size from 0.01 to 2 μf. Because some RC filter networks look like ordinary bypass capacitors, care must be exercised not to make improper substitutions. However, many different types of networks are used and are housed in containers about as large as voltage regulators. Ultimate solution to ignition noise is shielding and filtering. While it may be more expensive to put everything under cover, there is less chance of losing engine power due to spark suppression. Your local distributor and mail-order houses can usually recommend and supply suitable radio noise suppression components and kits. Additional information can generally be obtained directly from the individual manufacturers. Aerovox Corp., Distributor Div., 740 Belleville Ave., New Bedford, Mass. Birnbach Radio Co., Inc., 145 Hudson St., New York, N.Y.
Continental-Wirt Electronics Corp., 26 W. Queen La., Philadelphia, Pa.
Cornell-Dubilier Electronics, 50 Ave. "L", Newark, N.J.
Estes Engineering Co., 1639 W. 135th St., Gardena, Calif.
GC Electronics Co., Div. Textron Electronics, Inc., 400 S. Wyman St., Rockford, Ill.
Hallett Mfg. Co., 5910 Bowcroft St., Los Angeles, Calif.
E. F. Johnson Co., 2525 Tenth Ave., S.W., Waseca, Minn.
Philmore Mfg. Co., Inc., 130-01 Jamaica Ave., Richmond Hill, N.Y.
Sonar Radio, 73 Wortman St., Brooklyn, N.Y.
Sprague Electric Co., 91 Marshall St., N. Adams, Mass. Feedthrough capacitors differ from bypass capacitors in that the line from which interference is to be cleared is brought through the center of the capacitor, eliminating the additional connecting lead. As a result, this type of capacitor has no upper frequency limitations, and should be used if possible. Proper installation of capacitors is of great importance. Always keep lead length as short as possible, and be sure to fasten a capacitor securely to obtain a good electrical ground connection and to minimize loosening effects of vibration. 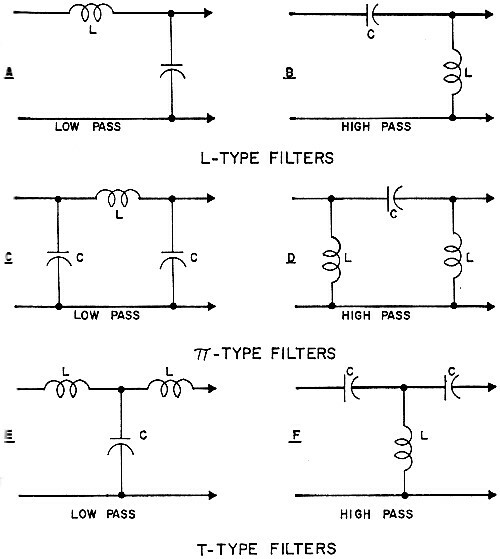 Filters combine the bypass action of capacitors and the reactance of inductors and resistors. 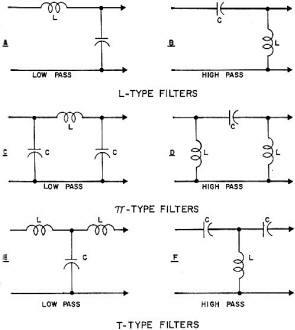 Also available are some special types of filters which are tuned to act as low-pass or high-pass devices for use in very difficult situations. Resistors are used in the spark-producing circuits. Carbon or composition resistive elements are generally enclosed in an insulated housing. External-type resistor-suppressors are normally designed for temperatures over 85° C, but internal types - as in spark plugs - can work under higher temperatures, up to 150° C.
Resistive elements are used to suppress noise from spark producing circuits. 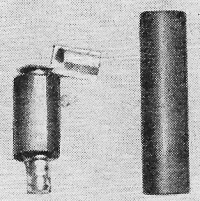 This type of suppressor should be placed as close to the spark source as possible to reduce radiation. Most resistors, whether external or internal, are in the 5000- to 10,000-ohm range. Suppressor-type high-tension ignition cables have a resistive center conductor instead of wire - on the order of 4000 ohms per foot - but age, temperature, vibration and rough handling cause short life. When the resistance value exceeds 18,000 ohms per foot, the cable should be replaced. Shields for radio interference are usually made from solid metal sheeting, wire mesh, or braided metallic wire. 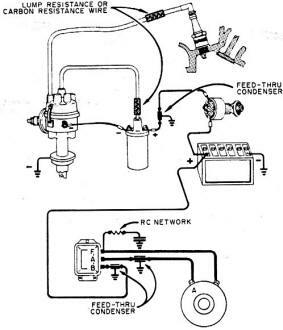 What the well-dressed ignition and generating system will look like after a radio noise suppression treatment. To complete the job, you should connect a good ground strap between the engine and car body. 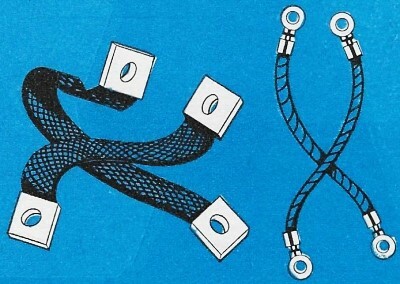 Bonding is accomplished by electrically connecting two metallic surfaces to provide a continuous low-impedance path for spurious currents to flow from one to the other. Direct bonds (welds), jumper bonds (tinned copper braid straps), and special bonds (brushes, slip rings, etc.) are the three most common types of bonding methods used. Corrosion is the number one enemy of a good bond. Where possible, moisture-proof all connections to make them more permanent. The author acknowledges contributions to this article by Champion Spark Plug Co., P. O. Box 910, Toledo, Ohio, and Hallett Mfg. Co., 5910 Bowcroft St., Los Angeles, Calif. 90016. Champion's excellent booklet called "Giving Two-Way Radio Its Voice" and Hallett's booklet entitled "Nothing But Noise?" - which will answer most of your questions about a commercial noise suppression system - are available for the asking from these companies.